A very quick, for now, review of the German film on Krishnamacharya, Der Atmende Gott, (The breathing God or the Breath of God). Think of this as a first look, M. is coming back from Japan this afternoon so I wont sit down to watch it through properly with a pencil until Tuesday. The main question if your not a German speaker is, should you wait until Spring for the English version or go over to Amazon.de and snap yourself up a the German Edition. Well I don't speak German, a few words here and there perhaps, but I'm delighted with it and glad I got my hands on a copy. First thing I did was slip in the 'extras disc' where we find a fuller treatment of some of the interviews in the main film. Here for example was AG Mohan giving a short lesson, in English, on the breath including kumbhaka, wonderful. On the whole most of the interviews are in English except, disappointingly, those with Sri k Pattabhi Jois,which might be a deal breaker if your an Ashtangi, you may want to wait for the English subtitle edition. Perhaps only a third of the film, if that, is in German, you'll get the hang of most of it and of course you can always put your german edition on Ebay when the English edition comes out. The Movie itself was beautiful as we can see from the trailer's. A feature-length documentary including rare historical footage as well as lavish reenactments. The old 1938 Black and White movie was it seems the centre piece of the movie but as far as I could tell there were no missing frames from the Youtube version we're familiar with. There are some beautiful 'mock-up's of the demonstrations Krishnamacharya would give with some of his students. There's a scene of this on the trailer but there are a couple more on the movie. Some phenomenal back bending and a wonderful moment were one of the students jumps in to prepare for Eka pada sirsasana (leg behind head), nods his head to one side and takes the leg behind his head without using his hands. Some kids performing a few postures in the Mysore palace, in the style of Krishnamacharya's early classes, staying in posture while one of the boys chants a 20 second mantra. An interview with a student on how Krishnamacharya would conduct a class, starting with pranayama, at least with this student. Also a flick through a photo album showing Krishnamacharya with hands on adjustment just as Pattabhi Jois used to do, so Krishnamacharya was, it seems, very much hands on in the early days. I was pretty much hanging on every word by Krishnamacharya's son Sri T.K. Sribhashyam, delightful man. 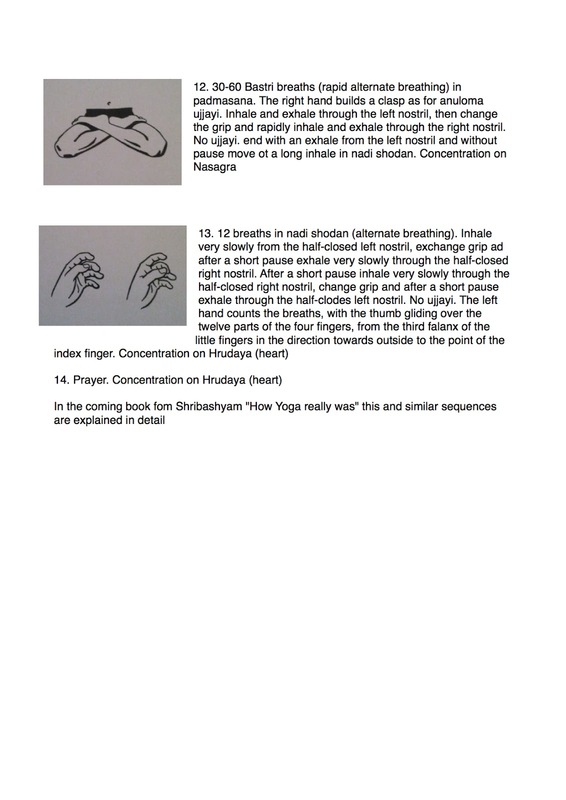 Oh and in the 'Life saving practice' on the DVD cover (see translation below) where it shows that Krishnamacharya was very much concerned with Drishti, he doesn't write about it that much in Yoga Makaranda and I'd often wondered if it was something that Pattabhi Jois had expanded on. Tristana is very present here. More to come on the movie in a future post and a proper review, this is just a taster. 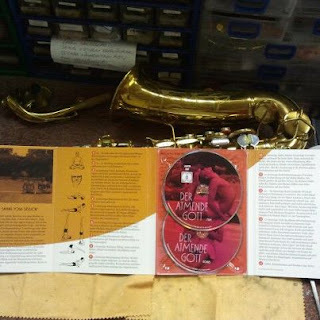 Thank you so much to Chiara for the translation of the cover art. 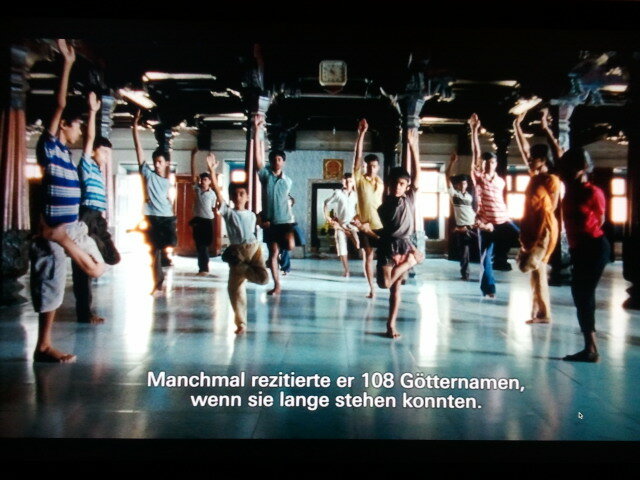 Q: In your movies you have s far dealt with the performing arts - opera, theater, dance - What made you interested in Yoga? A: This is the exterior side, yes. A yoga sequenca can posess a dance-like quality, when in the rythm you learn to breathe properly and maintain the correct concentration. Similarly it can happen that it is just a sport and nothing more, like in figure-skating and yet some athletes can turn it into dance. As in sport as in Yoga I am interested in the 'B-note'! Q: and what is the interior side? Q: I have the feeling that you made the movie to be able to practice with the great masters..
Q: your movie shows contemporary India and the India of the 30's. Is yoga not much older than that? A: of course, it is a very old discipline. But we do not know much about the physical yoga before the 20th century. Te philosophical tradition is very well documented, but the practice is not. And this goes together with the fact that physical yoga had a very bad reputation towards the end of thr 19th entury. It was thought a a practice by weird charlatanes, with their contortions and alms. But Krishnamacharya was the first to 'rehabilitate' the physical aspect of yoga and bring a new dynamic form which had a tremendous following and led to the growing boom that we see today. We also have the paradox that a thousands year old discipline was decisively influenced by a single man! Q: how did you as a Wstern director get close to this foreign culture? A: it was clear from the start that I had to be careful not to have a naive portrayal of this fascinating oriental world and the original pictures that I saw as a foreigner - and cameraman. Perhaps I can explain a bit about the choice of the music: I always find it a bit annoying that when we shoot movies on foreign culture we work with the music of these cultures, of which as Westerners know very superficially. But I know very well the music of my part of the world and I can use it almost as my voice. I used piano music from the 20s and 30s where musicians tried to reproduce an Oriental longing using Western techniques. This is also my job as director. Q: do you have the 'oriental dream' as director? A: many directors think that they can offer exptic pictures to the viewer and that will be it. For the director the pictures represent his oriental longing, but not for the viewer. Then the smells, the sounds of the place, the experiences before and after the film shooting are missing. So these have to be built, in order for them to be experienced by others than the director. A: I need to find the right context for the scenes, so they maintain their power. For example Shubha, the youngest daughter of Krishnamacharya had guided us through her persinal practice. This had enormous beauty and intensity. 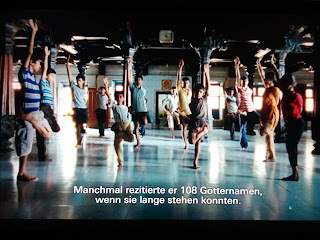 This personal demonstration represented for me the essence of Yogaand I knew that this would be one of the high points of the movie. And as I went back home to work on the movie, I did not want to loose the magis I had experienced. I thought that I coudl do this by placineg the scene at the very end of the movie, this would be its right place. And now it worked! Starting from the 50s more and more visitors came from the West to Krishnamacharya in Madras, to learm Yoga from him, the 'teacher of teachers'. 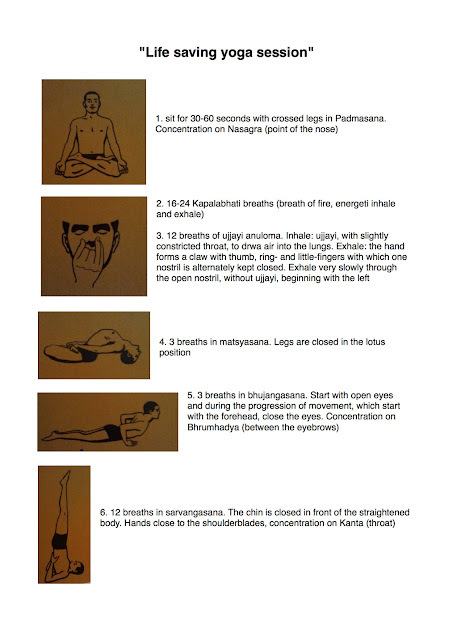 Krishnamacharya developed for them a specific sequence that he named 'Life saving yoga session'. Yoga to extend life, the name did not fail to work. Krishnamacharya's idea was to use this sequence to lead Westerners to an unconfessional and undogmatic experience of the Divine, since their pluralistic culture would not permit an automatic access to religious matters. 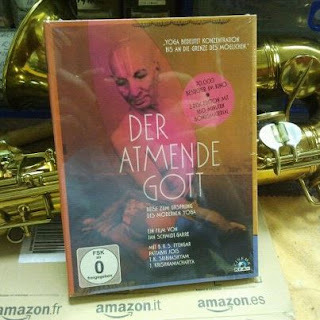 The sequence, which was not taught anymore after Krishnamacharya's death and which was taught by his son TK shribayam to director Jan Schmidt-Garre after years of acquaintance during the filming of 'Der atmende Gott', is here disclosed in its original form. 11. 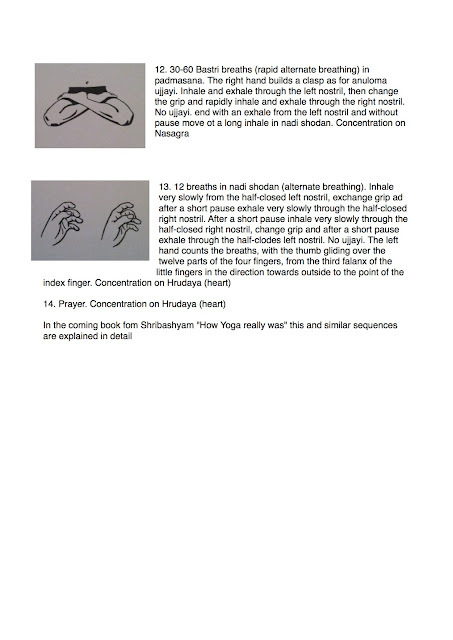 12 breaths in paschimottanasana, preparation and in maha mudra. The hands clasp the big toes, the back stays straight, neck and back form a lune. Concentration on the navel. sorry about the spelling mistakes in the translation... I realise there are a fair few. I also loved the kids' session with the Gayatri Mantra used to keep the time, and the footage with Krishnamacharya's daughters practicing and the typical kids' uncertainty, the younger looking at the older for cues... very sweet. Shribashyam was great, makes you want to travel to France and have a few classes with him. What also struck me was how different the man must have been with different people. Iyengar truly seems to have been traumatised by his experience.... and the old footage with him practicing is so different from a current standard Iyengar practice, he really has developed his own style, so much that of all Krishnamacharya's students he is perhaps the one who seems to be less 'faithful' to the tradition. Having said that, it is also true that they say Krishnamacharya taught differently to every student, so we do not know what was going on behind closed doors apart from some beatings, perhaps... interesting like he compared moving away as escaping a tiger.